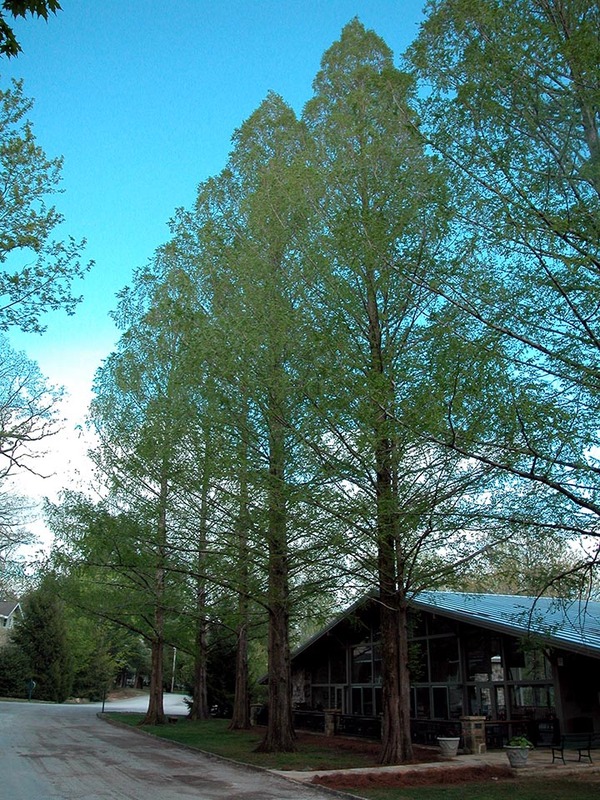 On the Monteagle Sunday School Assembly grounds stands a grove of some of the oldest known species of trees in the world. Dawn redwood has been found in fossil form dating back one hundred million years ago and was once native to most of North America. It was thought to be extinct until some trees were found growing in a remote valley in central China. In 1947 the Arnold Arboretum sponsored an expedition to the area and the collected seeds were brought back to share with nurseries, including some in McMinnville. Native Tennessean Andrew Lytle, a literary giant who helped form the famous Southern Agrarian Writers, lived in his ancestral log home in Monteagle and taught for both the University of the South and Vanderbilt University. He was nominated for the Pulitzer Prize in 1956 for his book The Velvet Horn. In 1964 Lytle planted the dawn redwoods in memory of his wife, Edna Barker Lytle, in front of the Harton Dining Hall on the MSSA grounds. The trees have become a living tribute.